All five of the Boston Bruins’ draftees from this year participated in Development Camp, and all five prospects looked solid. Actually, all of the 2018 prospects that took part in Development Camp this year were impressive. However, not all of them will make the jump to the big leagues for the start of the season. But who has the best shot at landing a spot come the season opener? Jack Studnicka, Axel Andersson, and Urho Vaakanainen are all players that could see a game or two at the NHL level, but how likely is it that one of these prospects actually gets shot? The situation for Studnicka is a little complex. At 19-years-old, he is not eligible to play in the AHL this season. That means if Studnicka fails to make the varsity roster, he would be obligated to return to Oshawa. However, the 6-foot-1 forward is determined to see his name on the Bruins starting roster come October. And he did just that—showing that he has the caliber to play in the NHL. He’s strong on the puck, makes plays under pressure, and has great vision of the ice—it always seems as if he’s one play ahead of the other. Those skills showed as last season with OHL Oshawa, Studnicka recorded career highs with 22 goals, 50 assists, and points as the team’s captain. After the OHL season was over, he played with Providence, appearing in five games and was a point-per-game player finishing with one goal and four assists. With the loss of centerman Riley Nash to free agency, there is an open spot down the center for Studnicka to take. There is no doubt that he will not be the only one competing for that spot however as Jacob Forsbacka-Karlsson and Ryan Fitzgerald also have a chance to see their name in the lineup. With their first pick in the 2018 NHL Draft, the Boston Bruins selected Andersson 57th overall in the second round. The 18-year-old comes from Sweden and describes himself as a “two-way defenseman” who can read the game well, shoot, and pass. 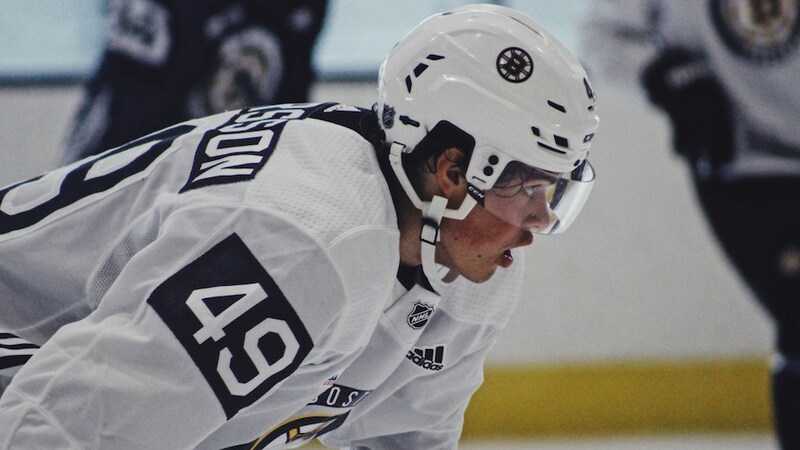 Andersson made such a great impression at Development Camp that he earned himself a three-year, entry-level contract with the Bruins. It may be a year or two before fans will see the 6-foot, 181-pound defenseman in a Bruins sweater, as his frame could use a little work. When he is ready, teams should beware. Andersson recorded a league-high 25 assists, and was a plus- 14 rating with 31 point in 42 games with his time in the Swedish junior league. He has also consistently played with the Swedish national team. The Bruins signed Vaakanainen to a three-year, entry-level contract back in early June which means the Finish defenseman will play in North America this year. Vaakanainen will be one of at least two other defensive prospects looking for a varsity spot come Septamber’s training camp—the other two being Jakun Zboril and Jeremy Lauzon. “It’s a big opportunity and a big chance to show how good I am. It’s great to see where I’m at right now,” Vaakanainen said. The 18-year-old defenseman scored four goals and seven assists for SaiPa in the Finish league, but those point totals do not indicate his style of play.